Sunday, December 25, 2016: Good Morning! Kit and I pray our Christmas message finds each and every one of you healthy, happy, and enjoying this special time of the year. We hope you are celebrating this day in whatever way you desire…that’s what makes America special, we all have deeply held spiritual beliefs and can freely follow our conscience in celebration of those beliefs. And please say a prayer for the men and women who are protecting our right to worship as we wish. Many of them are far from home and serving in harm’s way to protect our freedoms. Kit and I are celebrating Christmas with our daughter and her family. And yes, I know the journal is a few weeks behind…we have been spending more time enjoying life than documenting the adventure! Actually, I’ve been waiting for a rainy day to catch up! Kit and I also would like to wish everyone a very happy and healthy New Year! Love you all and hope to see some of you while on the road, and others when we return home in the spring! Hope you folks are able to travel soon as well…it’s a great life! Wishing you a joyous Christmas and a year of health, happiness and wonderful adventures. Thank you Irene…miss you and all our SD friends! Hope you have a great 2017! Thanks guys – may you both enjoy your wild time in Vegas and family time in between the play on the slots. Merry Christmas and a very Happy New Year to you both. Send me a silver dollar and I’ll play a round for you! Hope you are enjoying the family time in Virginia! Thanks folks…miss you guys and all our Sage friends! Hope you have a fantastic 2017! 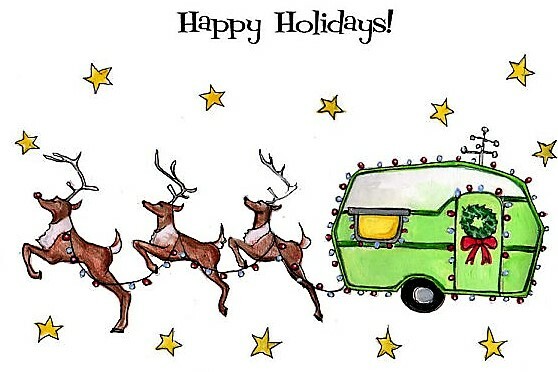 Merry Christmas to you and yours plus Happy Trails forever!!! Thanks folks…miss you and the rest of the LM alumni. Have a very enjoyable Christmas with your Las Vegas family – we made it safely to Sarasota and are in Joey & Linda’s driveway. Great to hear from you and glad you’re in Floridia with family… hope you folks have a great 2017! Merry Christmas Kit and Bill–Have fun “spoiling” those fine young boys!! We are…right now! Jack and Tucker say hi! Hope you folks fave a fabulous 2017! WE ARE BUSY THIS MORNING CLEANING UP THIS DISASTER AREA ESPECIALLY THE KITCHEN, 10 HERE FOR DINNER AND GIFT OPENING. Thanks for the comment! We know all too well the disaster recovery routine…good luck! Merry Christmas, Kit and Bill! Christmas is so much fun with two excited, boisterous young grandsons! Hope to see you this year! If you’ve not been to nearby beautiful Lake Tahoe, you have to make it one of your stops! Thanks! We hope to wander your way at some point this year…will keep in touch! 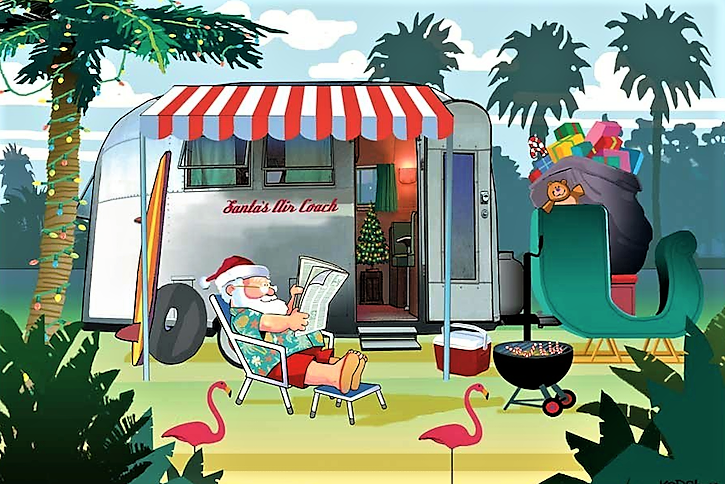 Love the Santa relaxing by his RV—–he deserves it after all his work overnight! Lovely, sunny, Currier & Ives day here, although a bit brisk. Enjoy! Thanks for the comment! Glad it’s sunny there…it’s nice here as well! Merry Christmas to you both! Safe travels and love the pics! Here is to a joyous new year! Hope to see you in San Diego whenever we wander that way! Hi, thanks for the wishes! The locals think it’s cold here as well, 48 degrees…spring weather up to home! Plan to be in the SD area in a month or so, will let you guys know…it will be great to visit you folks. Glad to hear you made it to Vegas and were able to spend Christmas with your family. Enjoying your posts. Happy New Year. Hi Middy, So happy you and Sally were able to attend the dinner/dance! I’m sure you were the Belle of the Ball 😊. Hoping Sally’s operation goes well and, you both have a great year ahead. No more nonsense for you two.